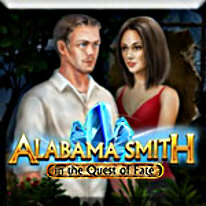 Join Alabama Smith and his girlfriend Anastasia as they hunt for the elusive Crystals of Fortune in Alabama Smith in the Quest of Fate. Using the Amulet of Time, they must jump back and forth between the past and the present to solve mind-bending puzzles, search for cleverly hidden objects and stop a shadowy nemesis from finding the Crystals first! The fate of the world is in your hands in Alabama Smith in the Quest of Fate.